The hosts took home more than a dozen gold medals, followed by the Republic of Korea (RoK) and the Democratic People’s Republic of Korea (DPRK) in second and third place. 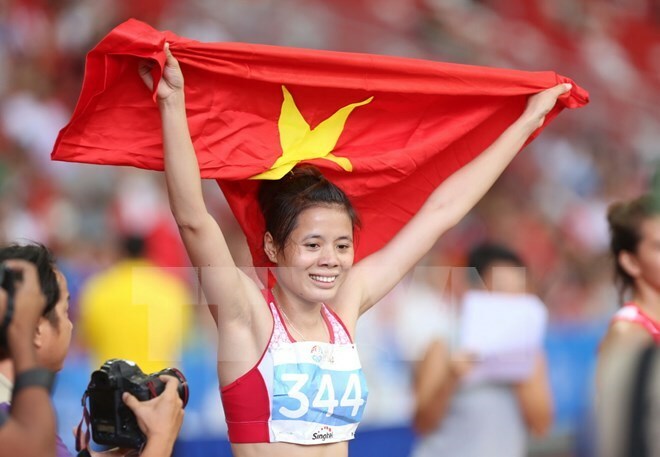 Nguyen Thi Huyen dominated in her favourite events with two gold medals from the women’s 400-metre race with a time of 54.47 seconds and 400-metre hurdles in 58.98 seconds. In the men's 100-metre and 200-metre races, Le Trong Hinh also won two golds, clocking in at 10.58 seconds and 21.27 seconds, respectively. Nguyen Thi Thanh Phuc in the women’s 5-kilometre walking took the gold and Nguyen Van Lai had the same success in the men’s 5-kilometre as well as another gold in the men’s 15-kilometre walking. A number of other golds were also bagged by Le Thi Mong Tuyen, Vu Thi Ly, Bui Thi Thu Thao, Pham Thi Diem and Nguyen Thanh Nhan. Meanwhile, the DPRK – vying for the first time in the tournament with three athletes – won two golds in the women’s 5-kilometre and 10-kilometre walking races.